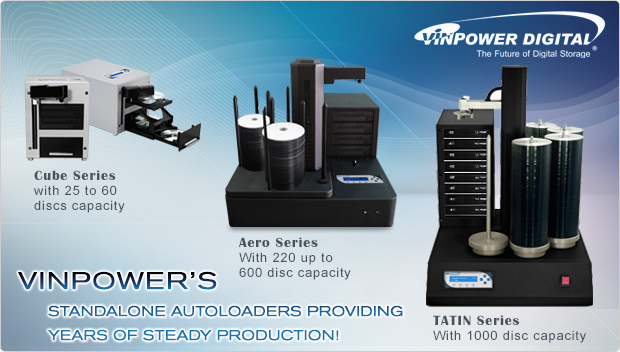 Vinpowerâ€™s Standalone Autoloaders Providing Years of Steady Production! When Vinpower first developed our own line of standalone robotic autoloader duplicators, starting with the TITAN series, we werenâ€™t sure how long the systems would last in the field. We knew we built the TITANS to be extremely robust, but only time would really tell. After nearly 10 years in production, we are still receiving compliments about systems working in the field that range anywhere from 5 to nearly 10 years old. When we started out, we were just hoping for the systems to work lights out through the 1 year warranty. But time has showed us that the TITAN systems were built to last way beyond expectations. So if youâ€™re looking to purchase a new standalone robotic duplicator to make continuous copies of your CDâ€™s, DVDâ€™s, or BD discs, then Vinpowerâ€™s line of autoloaders is perfect for you. Vinpower offers a range of options from small single drive 25 disc capacity Cube, to the slightly larger 2 to 6 drive 200 ~ 500 disc capacity Aero, to the always reliable 4 to 8 drive 1000 disc capacity TITAN Supreme. To learn more about Vinpowerâ€™s line of standalone robotic autoloaders, speak with a Vinpower representative or visit our website today. Using Wi-Fi for personal devices, such as smartphones and tablets, could make your data vulnerable. Weâ€™ve all heard the stories about celebrityâ€™s photos and personal data getting stolen or even large companies like Sony having their personal emails published for the world to see. Hackers are getting more and more sophisticated and one weakness that hackers are exploiting is accessing personal devices that are connected through Wi-Fi. As the storage capacity of our smartphones and tablets increase, plus with the increased functionality and capabilities, more and more people are using these devices for all of their professional and personal activities. So these devices will often contain many very important files, such as photos, business emails with attachments, spreadsheets, etc. Our phones went from voice communication devices to mini-computers that are constantly connected to us. The more those devices are connected and accessible through Wi-Fi, the more potential there is for a cyber attack that could remove or delete the contents stored on that device. Even less sophisticated, an individual could simply lose the device or have it stolen, which again would render the content as vulnerable or at least permanently lost. So whatâ€™s the alternative, no one will give up their smart devices and simply business cannot stop because of these threats? The key is to back-up your data onto a secure medium that is not susceptible to hacking or data loss. The most secure and easiest method to do this is to back-up your files onto an archival grade optical disc, such as DVD or Blu-ray. Optical discs have large storage capacity that continues to increase and the content on them cannot be deleted, altered, or stolen remotely. By saving these critical files to archival grade optical discs, you can be assured to always have a back-up should the worst case scenario happen. Plus, the costs of these discs are so inexpensive, you can repeatedly make back-ups as needed or in regularly scheduled intervals and it wonâ€™t create a drain on cash flow. For more details this or any other Vinpower products, please visit our website at www.vinpowerdigital.com or speak with an official Vinpower representative. Flash devices, such as a USB pen drive or SD card, have become relatively inexpensive, making them easier to use as giveaways or simply disposable in a sense. So maybe the cost of a flash device is no longer a deterrent to giving it away, but before you do, consider the fact that all the data you previously stored on that device could possibly be retrievable. Often we think simply erasing the content or reformatting will wipe away the data we had stored on a flash device. In reality, thatâ€™s not true. The way flash memory works, itâ€™s stored in nonlinear segments in the deviceâ€™s memory and typical erasing will only remove the root file or the path to that file, but not the actual file. So content that you thought was deleted, could be retrieved. So that could mean confidential business files, personal images, financial information, etc. 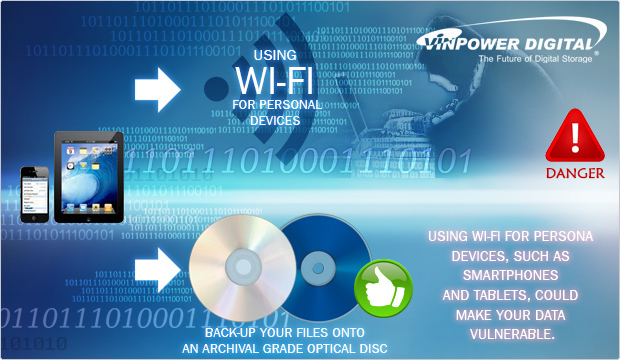 The only way to truly ensure that all data is completely unable to be recovered is to either destroy the device, which is both a waste and environmentally hazardous, or to perform a secure erase feature in the manner that Vinpower uses on their USB & SD duplicators. 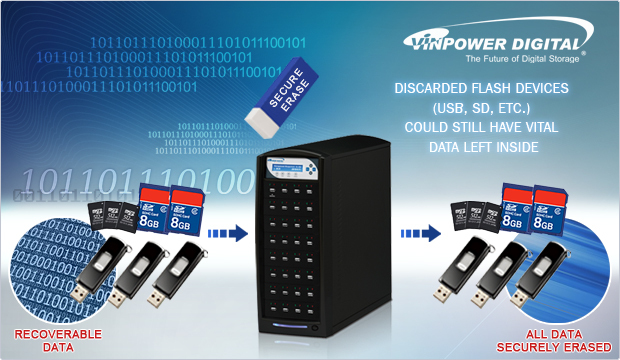 The Vinpower USB and SD duplicators run a series of clear wipe content functions that makes the previous data unrecoverable. Other companies may claim to offer a full erase option, but only Vinpowerâ€™s secure erase can truly give you piece of mind that your previous content will be completely removed and will not come back to haunt you. For more details on this or any other Vinpower products, please visit our website at www.vinpowerdigital.com or speak with an official Vinpower representative.